It could be said that desperate times call for desperate measures. For George Bailey, that desperate time was affording his own burial. Melanie Zimmer tells the extraordinary tale of how Bailey was finally buried in Central New York & The Finger Lakes: My Legends & Lore. George Bailey was a poor man. He drank quite a bit, and worked on a farm and as a handyman around town, taking what work he could. Among those who were thought to have employed him was Charles A. Genung of S.J. Genung & Sons Funeral Home in Waterloo. Others say George was simply a friend of the Genungs. By all accounts, George was a penniless man, and he realized that when he died, he would be unable to afford a proper burial. This troubled him and so he went to Charles Genung and asked if anything could be done about it. An agreement was reached, verbally or otherwise (it is uncertain), but when George died, Mr. Genung would have the right to use George’s body for as long as he found necessary. In exchange, he would then give George a proper burial when his body was no longer needed. Charles Genung had created a new system of embalming that was noninvasive. He developed tools to enable embalming to be performed without mutilating the body, and the embalming appeared lasting. The embalming technique was so successful that it is the same one used today. George died relatively young, at age forty-five, and was embalmed by Mr. Genung by a single injection. George was a tall man, six feet high, and weighed two hundred pounds. 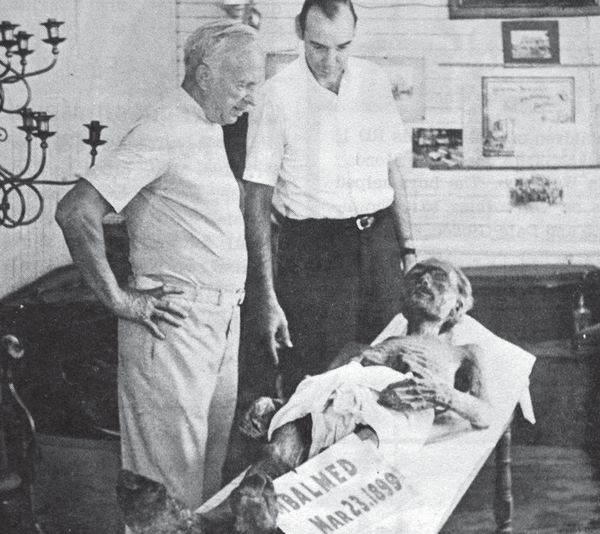 Once embalmed, he was dressed in a simple white loincloth and laid out on a marble slab in the garage behind the funeral parlor, although local legend says that George may have been posed sitting up in the funeral parlor at one time. George became “Bill” after embalming when the tune “Bill Bailey Will You Please Come Home” gained popularity. “Bill” became the Genung Funeral Parlor’s floor model for the new embalming method and morticians and funeral parlor directors traveled there from all over the world to see “Bill.” The garage where “Bill” was kept, across the street from the high school, was never locked. Kids would come, sit on the porch and holler, “Hiya ‘Bill!’” One girl actually tried to lift him and thought him quite light. His skin was said to be like parchment, and at one point someone stole one of his toes for a souvenir. George “Bill” Bailey. Thursday, July 29, 1971 edition of the Seneca Falls-Waterloo Reveille. “Bill” is on the right; John Genung, of the S.J. Genung & Sons Funeral Home, is center; and Bob Sherwood, a visitor, is on the left. This photo was published the day before Bailey’s burial. Reprinted from Central New York & The Finger Lakes: Myths, Legends & Lore by Melanie Zimmer, courtesy of Joseph Siccardi (pg. 139, The History Press, 2008). “Bill” Bailey was embalmed in 1899. During the time between his death and burial, he became well known to those in the community, as well as known to visitors from afar. “Bill” always received the most visitors on Halloween, when young boys were known to bring their dates to visit him. “Bill” remained on the slab through Charles Genung’s life, his son’s life and during part of his grandson’s life. At last, John Genung decided that “Bill” had paid his due and that they had no further need for his services. A grand funeral was arranged. “Bill” Bailey was dressed in a tidy dark suit, unlike the coarser clothing he wore during his life or the skimpy loincloth he donned in death. A funeral was held at the S.J. Genung & Sons Funeral Home and then “Bill” Bailey was buried in the Genung family plot in an unmarked grave to deter gravediggers. Some say that it was the biggest funeral ever held in the Finger Lakes Region. Perhaps a thousand people came. Doris Wolf, who shared her experience of Bill Bailey with me, told me: “If ‘Bill’ could have seen all the people at his funeral, he would have just died!” At least three newspapers were present, including the local Reveille, the Syracuse paper and the Rochester paper. The television stations were also eager to cover the grand event. John Genung posed by “Bill” Bailey for a final photograph, and then, finally, “Bill” Bailey was laid to rest on July 30, 1971, having worked longer and more steadily in death than he ever did in his forty-five years of life.